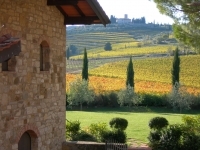 Surrounded by vineyards in the beautiful Tuscan countryside, the Fattoria Viticcio agriturismo is perched on a hill in the Chianti Classico area, overlooking the delighful market town of town of Greve in Chianti. Greve is just a 20 minutes' walk away or 5 minutes by car while we are 30 minutes from Florence and 40 minutes from Siena . The whole Viticcio Agriturismo is located in the middle of the vineyards and charming hills and all of the apartments have views over the countryside. The apartments are situated in the main estate building, a typical Tuscan property that has been specially renovated and tastefully furnished. Besides offering a taste of the countryside and fine traditional things, we offer a full range of comforts for the discerning traveller. Our Winery has produced marvellous wines since 1964 and during your stay you have the opportunity to visit the whole Estate and to taste and drink some really good wines and soak up the Tuscan country atmosphere! Alessandro & Nicoletta are happy to welcome you to Viticcio.